It’s a story that so desperately needs to be heard, but it’s a story that’s told here with incredible beauty and truth. It’s tremendously funny. It's got fit Scotsmen. It’s perspective-altering, life-changing theatre, and it reminds me why I fell in love with this remarkable art form in the first place. I just don’t get tired of it. 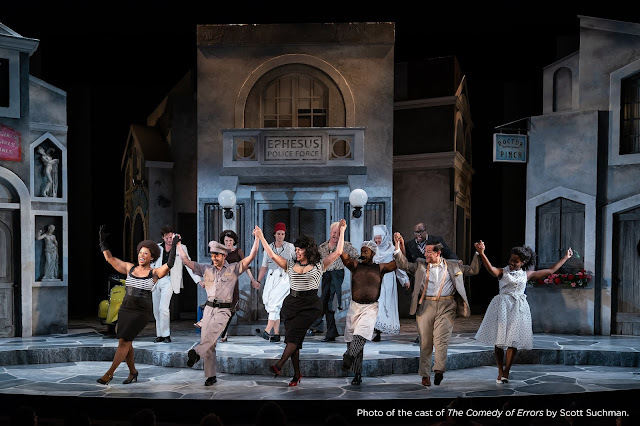 The production, once more hosted by the Shakespeare Theatre Company and produced by the National Theatre of Scotland, is just as powerful as it was on its first visit to DC in 2010. Every scene rings with truth even to those of us who’ve never dreamed of entering a combat zone; even though we know we’re watching actors portray a carefully choreographed sequence of events they’ve performed hundreds of times before, each performance still feels raw, fresh, and innovative. The ensemble features a few faces we saw two years ago, as well as a few more actors DC hasn’t met before, and director John Tiffany has shaped wonderful new performances from them. The privilege of seeing a show so many times is that I can choose where I direct my gaze with much more alacrity. When I know the conversation that takes place between Cammy (Ryan Fletcher) and the Writer (Robert Jack), I can watch the exact moment that other actors begin a stylized sequence of movements at the other end of the stage (I cannot sing the praises of Assistant Director of Movement Steven Hoggett enough; it is stunning work). I can watch the way the ensemble watches each other when they’re not speaking, and I can catch each tiny shift in mood, whether the ensemble are in the pub or crammed into a Warrior armored vehicle. Best of all, I can appreciate the myriad of ways in which Black Watch abandons the constraints of realism and instead relishes the different ways of storytelling that theatre is actually best at, from movement to music to simple reliance on the magic of imagination. The soldiers’ stories that Black Watch endeavors to tell are real enough; we don’t need to read a word of the letters the soldiers receive from home or to seek out a detailed translation of their movements in this sequence to feel the full emotional impact of the moment. By opting for stylization instead of realism, we actually gain more with the blanks left un-filled by the artists. If I seem inclined to wax poetically, it’s only because that’s what membership in the Society tends to do to someone. Once you see the show, I trust that you’ll understand yourself. So please- go see this play. I could go on and on about why I think it’s brilliant, but at a certain point, all you the reader will start to see is hyperbolic statements that will make you less and less inclined to see the show, and that’s a tragedy I don’t want on my hands or, as they say in the show, on my trousers (pronounced TROO-zers). A great blog post on the benefits of being in the Society of Those Who Have Seen Black Watch. Thanks for being such a great supporter of the production and welcoming us back to Washington, DC with such warmth. As someone who is also in the Society, I couldn't agree more!